Following the everyday lives of four high school girls: the flighty Run, the reckless Tooru, the timid Yuuko, and the level-headed Nagi. Mountain of Pancakes Kitou-sensei injures her hand during class and has to deal with it while Tooru brings cat Tansan to school with her to meet Yutaka and Miho. Later, the girls decide to get pancakes at a café where Miho happens to be working, facing trouble when Yutaka shows up out of the blue. Watch A Channel: +Smile Episodes Online at Animegg.org. 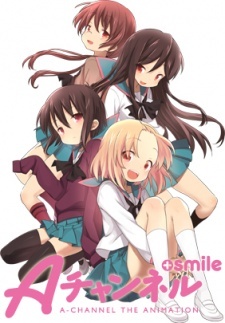 A Channel: +Smile is available in High Definition only through Animegg.org. Choose an episode below and start watching A Channel: +Smile in Subbed & Dubbed HD now.